Are you celebrating a special graduate's achievements? Are you the graduate and thrilled to have completed your degree? Mark the occasion for family, friends, and yourself with these ideas below. Do your alma mater proud by sporting the SUNY Buffalo State colors in all types of clothing and accessories, and displaying graduation mementos. Barnes & Noble at Buffalo State Bookstore offers a wide selection of Buffalo State sweatshirts, T-shirts, lounge pants, scarves, hats, and bumper stickers. There is a great selection of special graduation gifts including diploma frames, mugs, glassware, designer totes, and more. And certainly the bookstore carries a wide variety of books by campus and local authors (great gift idea! ), as well as national best-sellers. Families, stop by the Alumni Tent outside the Sports Arena before the ceremony to surprise your special graduate with flowers. No need to order ahead. You may contact the Alumni Association at (716) 878-6001 if you have any questions. Congratulations graduates! 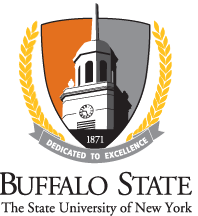 Be sure to visit the Buffalo State Alumni Association tent after your ceremony and sign up to receive your alumni ID card. With your alumni ID, you have access to exclusive benefits and campus services offered specifically to alumni of Buffalo State. Use your Banner ID to log into your online alumni network. Updating your information in the alumni online network connects you to 100,000 Buffalo State Alumni around the globe. Once connected, you will start to receive your alumni magazine, 1300 Elmwood, and also informative communication regarding alumni events and activities. Celebrate the day with your Alumni Association to find out more ways to stay connected to Buffalo State. Another great way to surprise your graduate is with the commemorative 146th Commencement ceremony DVD. DVDs are produced and offered by Buffalo State's Creative Media Services and available to order ahead here.